Several analysts had observed that the Pakistan Peoples' Party, headed by Benazir Bhutto, would find it difficult to join hands with General Pervez Musharraf because of two reasons. First, as Musharraf's power comes from his control of the military, therefore he does not want to make any arrangement under which he is forced to give up his uniform, the PPP would not be able to strike a deal with the general in uniform. There is no ambiguity at least on one account that G.M. Syed was a son of Sindh first and foremost. The rest is all just detail. The Sindh text board has been taken to task. They reportedly wanted to highlight the contribution of G.M.Syed much to the dismay of the Federal government. "G.M who?" you ask. Well this was the man who spent thirty years of his life in varying degrees of imprisonment, detention and house arrest.till his death in 1995. He was labelled anti-Pakistan, a separatist and was even charged with treason although never tried. I've been here a few days, and I haven't seen a thing. I've been too busy reading all the instructions and notices. It is amazing the number of notices New York expects you to read before you take a step, there are signs on the floor on the streets, on walls, hanging from poles, everywhere. 'Sidewalk Closed Ten Feet Ahead', I'm not bloody blind! I can see it's closed by this humungous barrier. 'Use sidewalk on other side of street', what am I, stupid? They tell you which line not to cross, who to give up your seat to, and to scoop your dog poo after you! 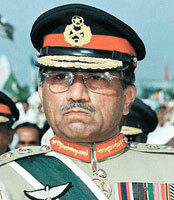 When the army took over in October 1999, the political party most damaged was Pakistan Muslim League-Nawaz (PML-N). 90 per cent of its office bearers and parliamentarians joined the newly formed PML-Q within days after October 9. The remaining 10 per cent were those who had no recognition beyond district level politics and consequently were unable to play an effective role in politics at the national level. Sub-Inspector Liaqat Ali, 55, lost his life piteously last month at the Police Training School (PTS) Chuhng in Lahore due to cardiac arrest. He had offered himself for training on a 'fake fitness certificate'. The fake certificate got by Liaqat before joining the training school concealed the fact that he was a heart patient. On the morning of July 25, 2007 he fell on the ground unconscious and was taken to Jinnah Hospital where he was pronounced dead following a cardiac arrest. PIA has to be perhaps one of very few (if not the only) airlines in the world which have a separate counter for members of parliament. Whenever I travel on it I come across this aberration -- something that has no place in this day and age. For starters, it is bound to offend PIA's other revenue-generating passengers (it's another story that most are so used to this blatant discrimination against them, and coupled with a general apathy among people on such matters, that no one says anything). Several analysts had observed that the Pakistan Peoples' Party, headed by Benazir Bhutto, would find it difficult to join hands with General Pervez Musharraf because of two reasons. First, as Musharraf's power comes from his control of the military, therefore he does not want to make any arrangement under which he is forced to give up his uniform, the PPP would not be able to strike a deal with the general in uniform. Second, the leaders of the pro-military Pakistan Muslim League, who currently head the government, will resist any deal with the PPP. Talking to media persons in New York on July 6 2007, Ms. Bhutto, instead of contradicting or accepting the meeting with President General Pervaiz Musharraf in Abu Dhabi, gave the reference of a statement issued by a presidential spokesman in this respect. The former Prime Minister said that she believed in dialogue to restore democracy in Pakistan and confirmed that her party was negotiating with President Musharraf's government. She refused that the UK and the US had played any role in her party contacts with the government. She further said that, "PPP had always opposed Musharraf in uniform. If the President would try to get himself re-elected from current assemblies, then we have an option to tender resignation, challenge it in the court and bring a candidate against him." Apparently, she is not opposed to Musharraf's re-election as a president. She seems to oppose it only when Musharraf is re-elected in uniform. She will support Musharraf, probably, in return for her exoneration from the corruption charges currently being pursued by the National Accountability Bureau. The people on the streets might not understand the difference between the uniformed and without uniformed general as long as he is at the helm of affairs, which he will after he is re-elected. The Charter of Democracy signed by the PPP and PML-N, as had been reported in the press, states that the two major parties pledge to end the military's role in Pakistani politics. Is this what the deal between BB and Musharraf envisages? Mind you, Bhutto is only talking about options in case Musharraf tries to get himself re-elected. She might not prefer to use those options. Keeping in view her limitations, one can simply imagine that BB might use the last out of the three options given above, and in this case, her presidential candidate is bound to lose. Talking to a Dubai based cable network TV, the president of PML-Q, Chaudhry Shujaat Hussain, said that his party had no problem in accepting a deal between BB and Musharraf in the best national interests. There are, probably, very few people in the masses as brilliant as the Chaudhry is to understand the 'best national interests'. Could he take some moments from his precious time to elaborate the stale concept of national interests to the hapless masses? Stating just the obvious, the opposition leader in the National Assembly, who is also the leader of the religious alliance Muttahida Majlis-e-Aml (MMA), Maulana Fazlur Rehman, has made sure over all these years that his party remains in a coalition government with the 'military-created' PML-Q in Balochistan, and rule the NWFP alone. He has always shown his displeasure with those among his rank and file who suggest to table resignations either with the speaker National Assembly, or end co-operation with the regime in Balochistan. It is no more a secret for the masses that the MMA, under the leadership of the Maulana and Qazi Hussain Ahmad, helped Musharraf secure parliamentary passage of a package of constitutional amendments aimed at 'giving a fig-leaf of democratic legitimacy to Musharraf's dictatorship' in 2003. But he is still the opposition leader. Probably that is what Sheikh Rashid wanted to say when he said that, "our opposition is friendly". Sheikh Rashid Ahmad, a leader of the PML-Q who had been close to the exiled former prime minister Nawaz Sharif in the past, and now a prominent figure in the present dispensation, said the other day in response to a question by a reporter of a private TV channel that an election alliance among the military-created PML, MQM of self-exiled Altaf Hussain, JUI of Maulana Fazl, and PPP of Benazir Bhutto is not unlikely. The military leadership of Pakistan is quite well-versed in distributing the share of these parties in the pie. Who knows that the Maulana might again become the head of Foreign Affairs Committee as he once was when the government of the BB was forced to nurture the Taliban movement in the nineties? The Maulana seems to be in a better position now, because, as he claims, he is able to bring the Pakistan military and the Taliban to negotiating table under the auspices of the US. One finds one's self in agreement with journalists Vilani Peiris and Keith Jones, who are of the opinion that "all the opposition parties (in Pakistan) fear that any serious struggle against the Musharraf regime could provide a point of entry for Pakistan's toilers into political struggle and risks destabilising the military, the institution that acts as both the bulwark of the Pakistani state and of capitalist property". Here seems to be a trope of the core issue. Believing but not believing in two contrary propositions at the same time. Political parties are meant to work for political institutions, but the mainstream political parties in Pakistan usually work to stop the way towards political institutionalisation. They will make all this hue and cry when a military regime establishes itself (when a military regime takes over, they usually welcome it), but when there is an opportunity to challenge the regime, they use different tricks to strengthen the regime. The masses have started understanding the process of doublethink, and have probably become expert in its use. A cab-driver remarked while talking to me the other day, "The rulers think they are deceiving the people, but I think the people are deceiving the rulers more than the people are deceived by the rulers." (The writer is an Islamabad based academic. On March 3, 1942 Pakistan Resolution was presented for the first time in Sindh Assembly. The mover of the resolution was none other than G.M.Syed, the man whose name soon became synonymous with the demand for Sindhudesh or independent Sindh. So how come the darling of Muslim League, the man who was made the Provincial Chief of Muslim League by Jinnah, the man who in 1938 organised a meeting of the Sindh Muslim League at Karachi where the Leaguers were given an overwhelming welcome become a 'Pariah'? Political analysts and historians have differing views. Some point to G.M's obstinate idealism citing his refusal to back Muslim League's feudal candidates when Jinnah declined to accept his nominees for the 1946 elections. Some declare that the candidates' episode wasn't that serious; what made him a pariah was his falling out with Jinnah over what Syed considered the former's disregard for Sindh's rights soon after 1947. It was then that he was expelled from the Muslim League. Some point out that for him Sindh and Sindhi interests came first, regardless of the political party. His membership of the Indian National Congress and later Muslim League are quoted as examples to support their point. An ardent member of the Congress, he fell out with the Congress leadership over what he considered the leaders' disregard of rural Sindh's problems. Reportedly, Congress leaders Maulana Azad and Sardar Patel came to investigate Syed's allegations but could not satisfy him resulting in Syed's quitting Congress. He then joined the Muslim League. Some analysts declare that G.M.Syed became convinced and frustrated much later when he realised that provincial autonomy would always be a dream. After all, before the dismemberment of the East and West wings of Pakistan it was G.M.Syed who tried to bring Wali Khan and Sheikh Mujeeb Ur Rehman around. He struggled against the One Unit System leading to its dismantling in 1970. He supported the legislative restoration of the Sindhi language position in 1972. Thus, he tried to struggle for Sindh's rights within the system. However, the final straw for him was the dismemberment of the country .It was then that he lost all hope for provincial autonomy and articulated his 'Sindhudesh' call. Whether Syed was an idealist, a separatist, a realist or a nationalist is a matter of opinion. What is understood is that all his life Syed articulated Sindh's interests. He resisted vehemently the separation of Karachi from Sindh, the dispersal of evacuee properties, the creation of one unit, the allotment of barrage lands to non-Sindhis, the relegation of Sindhi language to irrelevancy in the educational/official system and the erosion of provincial autonomy. It is clear even to his worst critic that Syed's agenda was Sindh. But lack of electoral majority in Sindh and his failure to reach the heights of let's say Bhutto or Khuro is questionable. Some analysts declare that Sindhi politicians have been divided over the strategy for attaining the rights of Sindhis. One school, which is the majority, believes that nothing can be achieved through open confrontation with the establishment and that the only feasible course is to fight from within. In other words, if you can't beat them join them. This group, according to Sindhi political analysts, include leaders like Shahnawaz Bhutto, Muhammad Ayub Khuro, Allah Bux Soomro in earlier generations and in the later ones, Zulfikar Ali Bhutto, Mumtaz Ali Bhutto, Muhammad Junejo and of course Benazir Bhutto. They contested elections were in power and sometimes out of power but made their compromises with the main ruling establishment. These politicians contributed to the whole of Pakistan for instance Hafeez Pirzada gave Pakistan the 1973 constitution, Bhuttos of course also contributed. However, another set of Sindhi politicians were people like Syed who did not. He had little respect for those whom he considered collaborating with the main ruling establishment. He believed if Sindhi politicians had not collaborated with the ruling establishment, the fate of Sindh would have been different. Some analysts believe that perhaps his vision might not have too off the mark. In present day Pakistan, we do see challenges in having an effective federal system where the provincial autonomy is secure. Whether it is Balochistan, Sindh, NWFP or parts of Punjab, all are trying in various ways to articulate their demand for greater provincial autonomy: what Syed tried to do all his life. A prolific writer Syed wrote more than sixty books mostly in Sindhi on politics as well as arts and literature .One of his more interesting books was the 'Nine Jewels of Modern Politics' in Sindhi and Urdu, giving critical analysis of the political careers of Jinnah, Gandhi, Iqbal, Nehru, Maulana Kalam Azad among others. As a government minister, he laid the ground work of the Sindh University, which later became the Karachi University. He established the Sindh Literary Advisory Board which later developed into the Sindh Adabi Board. In 1925, he formed an organisation of farmers to protect the rights of the growers of the Karachi district. In 1926, he founded an organisation for promoting the interests of growers of Mahal Kohistan, an arid zone and neglected area of Dadu district. These activities extended to the founding of the Lower Sindh Cooperative Bank in 1930. By faith, Syed was a liberal Muslim having moved away from the orthodox version of Islam and adopted Sufism as his creed. He incorporated certain elements of Buddhism and Jainism in his personal faith. He was also influenced by the doctrine of Ahisma preached by Gandhi and the Frontier Gandhi, Abdul Ghaffar Khan. Even after so many years after his death, G.M Syed remains an enigma. Author M.S.Korejo states, "G.M Syed was at one time the most reviled man in Pakistan and at the same time a demigod to his followers. Yet neither could his detractors clearly pinpoint their principal cause of revulsion for the man, nor could his supporters elucidate the precise clarity of his thought and vision. The press and political commentators ignored him to the point of disbelief of his very existence. It was almost as if this mover of history was arbitrarily adjudged, convicted and relegated to the footnotes on the back pages of history without the benefit of fair proceedings. It seems as if the verification of contradictions attributed to him by others were considered by the political establishment as too tiring an effort." Whether or not this continues, it remains to be seen, but at least on one account there is no ambiguity that G.M. Syed was a son of Sindh first and foremost. The rest is all just detail. Obviously the overwhelming majority of New Yorkers have never been to Lahore, and therefore labour under the delusion that they live in the most wonderful city in the world. Of course they are wrong, but not too far wrong; a visit to the Big Apple has many pleasures to offer. One of the chief of these is a day spent at one of the marvellous art galleries, the Metropolitan or Moma, and taking time out for a leisurely lunch at the gallery eatery! No, no I am not quite provincial, and do go to soak in the art, and even claim to understand and appreciate it, but I must confess that the pleasure of lunch is in a class by itself. Perhaps it is because one feels one is in the middle of a serious endeavour and a fine purpose. But there is something about the aura of a gallery restaurant which is most satisfying. There is also the feeling that one is overwhelmed by the sheer quantity of art, and that one can never experience it all. One way out of that is to circumscribe the visit by homing in one of the special exhibits, and just taking in snatches of all the rest in passing. This time round there was a show of the works of sculptor Richard Serra; a retrospective of forty years of work, spread over three floors. Huge mansion sized forms made out of what seemed to be sheets of rusting steel folded and twisted into shapes you could walk through. And New York is also the theatre centre of America, although this is not the opera season, there is oodles of regular theatre. Once again one is constrained to pick and choose, and we chose Vanessa Redgrave. She has long been a theatre icon for our times, but there was also a bit of nostalgia thrown in, because we happened to be in London back in the sixties, the time of the great anti-war 'Aldermaston Marches' when Redgrave was making some of her landmark performances, and also making a name as an activist. It was also the time when her father, the magnificent Sir Michael Redgrave was still at the height of his powers performing in the West End and impressing a younger me enough to read up two of his biographies. And the performance was at the Booth Theatre, named after Edwin Booth the brother of the other Booth who had assassinated Abraham Lincoln. Too many associations to resist! The performance 'The year of Magical Thinking' was a tour de force, a one-person monologue, on a bare stage; and Vanessa kept a full house rooted to our seats for an hour and a half! So if you happen to be passing by, I've already made a good choice for you, and then you can take time out for a chicken pannini at the cafeteria at Moma! Or maybe hold on, I am here for another week and may come up with even more brilliant suggestions. In such a scenario, Makhdoom Javed Hashmi was a ray of hope for PML-N and its exiled leadership. Mian Nawaz Sharif, before leaving the country, appointed him acting president of his party. It was because of his commitment with the party that Nawaz Sharif nominated him as a party candidate in the 2002 general elections from his home constituency in Lahore. He also managed to mobilise the party workers whose morale was low in the wake of government propaganda that Mian Nawaz Sharif and his family had left country under a deal. His success infuriated the military establishment. He was jailed nine times on different occasions between October1999 and October 2003. On October 29, 2003 he was arrested for the tenth time, nine days after he distributed a letter to the media in the parliament's cafeteria. The letter was allegedly written by an anonymous Pakistan Army officer and incited people against the army. 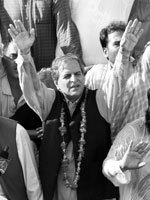 Hashmi was sentenced to 23 years in jail on April 12, 2004, on charges of inciting mutiny, defaming the army and army officers, forgery and abetment by a lower court. On August 3, 2007 the Supreme Court of Pakistan ordered his release. This has come as a setback for government while a good news for PML-N because he is the party's only popular leader in Pakistan. Before his release Raja Zafarul Haq was leading the party who could not mobilise his party very effectively -- it is alleged that PML-N failed to exert pressure on government even after Hashmi's arrest. The role of PML-N was minimised for want of an energetic leadership in the past four years. As for Hashmi, he has spent six out of eight years of the present regime in imprisonment. He was victimised because government knew that he was the only leader in PML-N who has the energy to create problems for the government. Even the speaker of the National Assembly did not order his production in the House throughout his confinement. "He will lead movement of workers from the front as he is an activist and does not believe in drawing room politics," Iqbal says. "Hashmi enjoys very good relationship with leadership of all opposition parties; his active role in politics will help to create a close liaison among different opposition parties." Ahsan admits that his party was dysfunctional at least at the leadership level in the last four years in Pakistan and that may be the reason that PML-N's role for release of Hashmi was not considered up to mark. According to him Javed Hashmi will work here in politics as deputy of Mian Nawaz Sharif and Shahbaz Sharif. Even his political rivals admit that his release will have a positive impact on the politics of opposition. "He is acting president of a big political party of Pakistan and also enjoys good support with his party workers so he will definitely play a positive part," says Shah Mahmood Qureshi, president PPP Punjab chapter. Both Shah Mahmood and Javed Hashmi traditionally contest election from the same constituency of Multan (NA 149) and last time Qureshi won. "I am provincial head of ARD while he is central head ARD and it depends on our parties to decide who will contest elections from where. But in the last elections I won elections from Multan while he won the NA seat from Lahore and principally I should contest elections from Multan while he should from Lahore." Even if PML-N decides Javed Hashmi contests election from Multan, Mahmood Qureshi is ready to face him. Javed Hashmi is very clear about his role in the politics of Pakistan. He says that he enjoys full support of his exiled leadership and he has no intention to breach their confidence. He tells TNS his prime objective is to fight dictatorship until it vanishes from the country "I will continue to struggle for the country's freedom from the clutches of dictatorship even I am put behind bars again for doing so," he says. "It is a tyranny that most of us instead of fighting the prevailing system become part of the system after getting elected. In this way, though we are able to get some personal benefits, it damages the people and the country." The PML-N leadership is clear about not allowing the opportunist politicians to play any role in the party, Hashmi says. "At least 50 per cent of parliamentarians including senators of ruling party are in contact with us and many of them have already submitted their resignations to our party but Mian Nawaz Sharif is not ready to give them space," he says. Hashmi, who also is the president of ARD, wishes to see all opposition parties together on one agenda -- restoration of true democracy without any role of military. "Judiciary will not approve doctrine of necessity and army rule will soon become a part of past in Pakistan," says Hashmi. Hashmi thinks that lawyer community and media have played a very important role in the movement for independence of judiciary. Now it is up to the political parties to follow them. "We need to lead the movement from the front." A short spell of controversy followed the incident and his colleagues criticised the school management for tough training conditions. Some of them held Chuhng Police Training School Principal Major (retd) Mubashar responsible for giving hard time to the senior trainee officials. The criticism disappeared in thin air when 17 out of existing 607 senior trainee police officers were reportedly declared unfit for training by one cardiology institute. More are expected to be exempted from training as a result of their medical re-examination launched by the PTS Chuhng after the death of SI Liaqat Ali. It may be noted that the government has increased the age limit from 45 to 55 for the promotion of a police officer to the level of Inspector from Sub-Inspector. This has forced many to get fake certificates of fitness at the cost of their lives. Talking to The News on Sunday Mubashar said, "One of the 17 unfit officers can hardly stand on his feet but still insists to get trained and promoted to the rank of Inspector. The concerned SI is so obsessed with his promotion that he has offered written self-responsibility in case he loses his life during training. "We have turned down his offer," he added. Mubashar further said he would be writing to the concerned district administrations to take action against the doctors responsible for issuing fake medical certificates to the aged employees of police. One administrative officer in Peshawar told that practice of producing fake medical certificates to avoid routine parade is also common among young police trainees. "It's like a double-edged sword, as the aged trainee police officers produce fake fitness certificates to join the training, the young trainees use it to avoid training courses." However, the practise of using fake medical certificates is neither limited to the police department nor specific to Pakistan. The Directorate of Vigilance and Anti-Corruption in Tamil Nadu, India, has recently unearthed a multi-million fake medical certificate scam in Railways department where public servants are involved in claiming compensation on medical grounds, causing crores of rupees loss to the Indian Railways annually. The scam that hit the newspapers headlines on August 2, 2007 pertains to the issue of fake medical certificates by government doctors to beneficiaries, mostly public servants, enabling them to claim compensation to the tune of several crores from the Income Tax and Labour departments and insurance organisations between 1999 and 2003. But story does not end at the public departments in Pakistan, India or anywhere in the third world. Students in the educational institutions and travellers to foreign countries are also major beneficiaries of the fake medical certificates. Particularly by those travelling abroad for job and other assignments. In Middle East, the respective governments have, therefore, ordered re-examination of all immigrants travelling from Pakistan and other Asian countries. Press reports suggest that many are deported from the airport once they are diagnosed with chronic diseases not disclosed by the medical certificates procured from the local (Pakistani) medical laboratories. Sources in the intelligence agencies reveal they receive number of queries regarding issuance of fake certificates by the private sector medical laboratories. Majority of these laboratories are at the panel of different embassies. 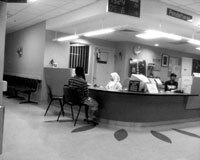 The aspirant immigrants are bound to deal with them in getting medical certificates against heavy fees. Sources in the doctors community believe that the financial position of the doctors, inducted to the panels of foreign embassies and consulates, have changed overnight. A TNS survey revealed that doctors were charging $2500 for medical certificate to US immigrants and $1500 for rest of the world including Europe and Middle East. Dr Mohammad Mohsin, a local doctor, told that heavy fee against each medical certificate has made it very attractive for the doctors community. Times are gone, he asserted, when we were supposed to charge Rs30 to issue a medical certificate to the public department employees. Medical Superintendent of a local Hospital, requesting anonymity, told that the personal staff of the medical practitioner is also involved in issuing fake medical certificates across the country. The medical practitioner is sometimes unaware of many deals under his nose carries out by his staff. Issuance of fake medical certificates in the field of insurance is also very common. A doctor told that one insurance agent produced his fake ECG test to sell health insurance policy at the earliest. Many public sector employees grease the palm of medical practitioner in order to get early retirement on the medical basis. In principle, any medical practitioner registered with the government can issue a medical certificate. If one wants to check the misuse of authority, he is supposed to initiate legal action under the anti-corruption laws against a medical practitioner. But the medical practitioners have a very simple excuse that no symptoms of a certain disease were visible in a patient the medical examination was conducted. Therefore, the violators of the law are playing with the lives of many poor ones like Sub-Inspector Liaqat Ali in connivance with the corrupt public servants. PIA has to be perhaps one of very few (if not the only) airlines in the world which have a separate counter for members of parliament. Whenever I travel on it I come across this aberration -- something that has no place in this day and age. For starters, it is bound to offend PIA's other revenue-generating passengers (it's another story that most are so used to this blatant discrimination against them, and coupled with a general apathy among people on such matters, that no one says anything). Other than that, one would like to ask the PIA senior management as to on what grounds can it justify such preferential treatment to a particular section of society -- especially one that is already so privileged. Of course, setting aside separate counters for say handicapped passengers (which is not done) or for those who have no bags to check in makes sense and is not discriminatory but to allow MPs a separate counter is absurd. During a flight last week from Lahore to Karachi, one again came across this 'Parliamentarians only' counter. Just for the sake of curiosity, a PIA ticketing official at one of the other counters was asked about this. Actually what led to her being asked this was a request for a bulk head seat -- next to the aircraft's door and which always has more leg room than seats in other rows. This is one of PIA's perennial mysteries because by right any passenger can request to be allotted such a seat and any normal airline would allocate it on a first-come-first-served basis. But not so at PIA -- you may call the much-advertised reservations call centre number 111-786-786 even a week in advance or ask for a bulk head seat when you buy the ticket well before your scheduled flight but the standard reply is that no seats are available. However, when you board the plane you invariably find that at least some of these seats are available. The only plausible reason for this is that some bulk head seats are kept in reserve and not allotted to any ordinary passenger just in case a member of parliament or other such VIP happens to get on that particular flight at the last minute. As for the PIA official who was asked why the airline should have such a counter, her reply was that in the past some employees had even been suspended after MPs were not given the seats of their choice. Hence, the separate counter -- according to her -- while a way to placate the members of parliament, was also a means for the airline to protect its own staff. By the way, the official also said that in this regard armed forces officers were often equally demanding of good seats and for them too the airline had to make similar concessions. But whatever the compulsions, such preferential treatment cannot and should not be justified on any grounds -- and also helps explain PIA's decline compared to other world airlines, most of which would never have such biased policies -- even if they were fully or partly government-owned. This matter also helps explain some of the factors behind the airline's decline, and these are often not mentioned by the usual industry 'experts'. For instance, the fact that the airline comes under the ministry of defence and has been used and abused by successive governments -- often as a kind of job-generating factory for their political favourites or by successive heads of government to reward their friends (by appointing them to head the airline) -- is usually ignored. This probably has the biggest role in the airline's decline and unless this government interference is stopped chances are that wholly discriminate aberrations like separate counters for members of parliament will not be stamped out. This doesn't necessarily mean that the airline should be privatised (who will buy such a loss-making enterprise in the first place, and with an ageing fleet) but rather that the government, particularly the ministry of defence and politicians don't interfere in its operational matters and that MPs don't treat it as their personal transport service. Also, it would be good if PIA's passengers -- those who don't happen to be MPs, ministers, army generals or related to a senior airline official -- also become a bit more assertive about their rights as full-fare paying revenue-generating passengers and demand that they be given equal treatment in matters as basic as seating. (Incidentally, the passenger next to me on the flight -- a resident of New Jersey but who often took the JFK-Lahore PIA flight -- told me that recently he had travelled on that route twice and both times the flights in-flight entertainment system had failed to operate. The flight was for 16 hours and the passengers could not watch any TV or listen to music!). Just by way of comparison, while travelling on Thai to Bangkok last year, with wife and our one-year-old son, we weren't able to get bulk head seats initially. However, on each flight sector -- we took a couple of domestic flights in Thailand as well -- the airline staff went out of their way to make such seats available for us, which was a huge help given that we had an infant with us. I can't imagine that happening in PIA's case -- unless things turn around in a big way. Let's see what the new MD of the airline is able to achieve in such matters -- given that such matters are very important to the airline's passengers.